“This week we’ve been forced to again confront how far we still have to go in the struggle for true equality,” he said, referring to the viral videos that showed a popular school-security officer in Spring Valley High School forcefully removing a disruptive student from a classroom. “Our schools must be a pathway to opportunity, not a pipeline to prison,” Duncan added, according to Education Week. As I’ve said repeatedly, every year, every single year, our K-12 schools suspend roughly three and a half million students, and refer a quarter of a million children to the police for arrest. If our collective goal is to end the school-to-prison pipeline, that is simply unacceptable. These aren’t just somehow numbers, or statistics, they’re our children. And it should come as no surprise that these children being suspended and arrested are disproportionately students of color and students with disabilities. We can no longer have this conversation, let alone fix the problem, if we’re unwilling to talk about race. The Obama administration – including both the Departments of Justice (DOJ) and Education – issued school guidelines in 2014 that claim students of color are “disproportionately impacted” by suspensions and expulsions. 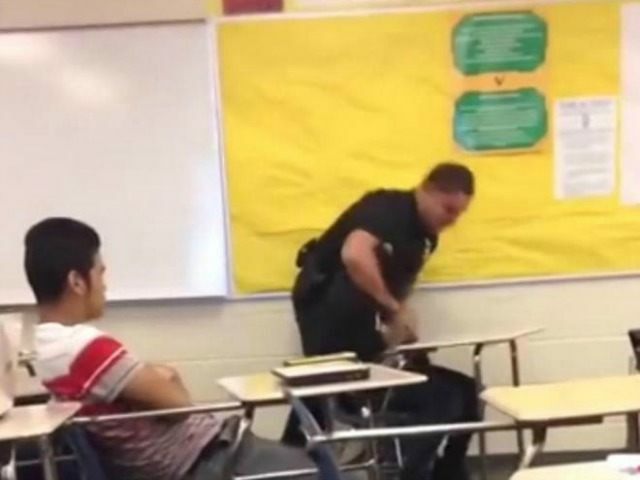 As Breitbart News reported Sunday, despite the Obama administration’s attempt to make the incident about race, hundreds of both black and white students at Spring Valley High walked out in support of Ben Fields, the Richland County sheriff’s deputy who was fired after the incident. Ironically, as reported by Breitbart News last March, one year after the Obama administration issued its new race-based guidelines, Hoover Institution media fellow Paul Sperry observed in the New York Post that liberal policies such as “restorative justice” and “peer juries” are recommended for students of color rather than discipline for unacceptable behavior. These policies based on social justice ideology, however, are actually making schools less safe, noted Sperry. The new policies may lead to fewer suspensions, but Sperry warned those reports do not necessarily mean there have been fewer infractions of the rules. In Portland, Oregon, he reported, where millions of dollars have been spent on restorative justice and “courageous conversations about race,” a black high school student repeatedly punched his white teacher in the face, sending her to the emergency room. Subsequently, the teacher was reportedly counseled by the assistant principal not to press charges against the student, and was “lectured … about how hard it is for young black men to overcome a criminal record.” Additionally, the teacher said, according to the Willamette Week, the administrator told her to examine what role she, “as a white woman” with white privilege bias, played in her own attack.